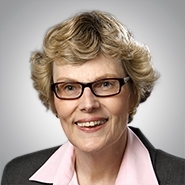 MILWAUKEE, Wis. — The national law firm of Quarles & Brady LLP today announced that Ann M. Murphy, a partner in the firm's Milwaukee office, was selected as a 2015 Woman in the Law by the Wisconsin Law Journal. Women in the Law honorees are the top female attorneys who display outstanding achievement in the practice of law in the state of Wisconsin. This year, 30 women were selected and honored at an awards ceremony on June 11. Murphy is a member of the firm's Business Law Practice Group, and her significant experience in commercial lending, syndicated loan transactions, and acquisition financing has placed her at the center of numerous high-profile, major transactions, while her tenure as bond and bank counsel in tax-exempt and taxable financings has involved her in some of the most noteworthy public finance transactions in Wisconsin history. Murphy was the first attorney—male or female—to be named Milwaukee office managing partner at Quarles & Brady, a position she held for 12 years. She also was the first woman to be elected to the firm's Executive Committee, and was active in the formation and programming of the firm's Women in Leadership Program. "Over the course of her career, Ann has repeatedly broken through historical barriers to women in the industry, establishing pathways to real and meaningful success for other women at the firm," said Katie Perhach, Milwaukee office managing partner of Quarles & Brady. "I speak for many of my colleagues when I say am honored to practice alongside her and have learned from her what it means to be a strong woman in the law."